The hardware inside Toshiba's A505D certainly offers reasonable performance for the budget-conscious consumer, but the overall design of the unit leaves a lot to be desired. It seems like for every design win, for every perk, there's something else undone. Toshiba outfits the unit with what they call their "Fusion Finish with Sonic Pattern in Black Onyx." What this means is an absolutely relentless, unchecked use of glossy black plastics with silver accents. 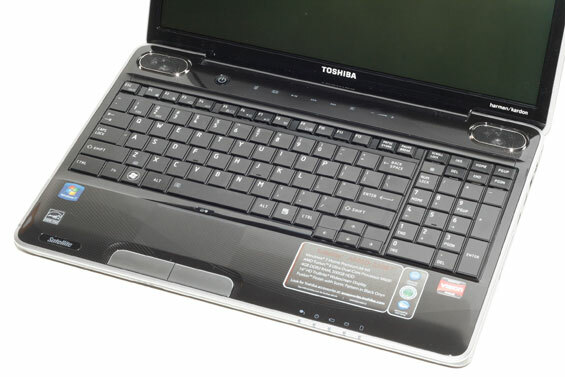 The overwhelming majority of Toshiba's notebooks on the market are head to toe glossy plastic, and for us it means the difference between "bargain" and "cheap." Gloss on the lid is still fine and fairly common, but most manufacturers are quietly edging away from using glossy plastics. Even Toshiba recently announced their "Fusion X2," which utilizes more attractive, less gaudy matte plastics. For those of you that like glossy laptops, though, the A505D might just be your dream come true. When you flip open the lid, you're presented with a design most other manufacturers have since abandoned. The Harmon Kardon speakers above the keyboard sound excellent for notebook speakers; they're a bit tinny but notebook sound quality is a contradiction in terms. Unfortunately, situated between them is a series of touch-based media buttons. Toshiba at least backlights them with white LEDs, but the touch-based volume control is disappointing. Toshiba was one of the last stalwarts to employ an analog volume control dial on their notebooks and the omission is missed. Below the speakers and media buttons is the keyboard proper. Toshiba's keyboard layout really is one of the better ones we've seen come through, including a full-sized numeric keypad along with dedicated document navigation keys. They even managed to include a scroll lock key! To top it all off, the keyboard is backlit with subtle, attractive white LEDs. It's just a shame the keyboard itself is so lousy. When we say head-to-toe glossy plastic, we mean it, and that includes a glossy plastic keyboard. The keys are devoid of texture, have only the most minimal beveling, and just don't feel particularly stable. What you're left with are completely flat, smooth, wobbly keys that make typing a lot less enjoyable than it ought to be. At the bottom we come to the touchpad, which mercifully has a nice matte finish and texture that makes using it a pleasure. There's a dedicated button to enable and disable the touchpad above it, and it's multi-touch capable. The buttons themselves are curiously large, but they feel fine and offer the right amount of resistance. And finally, around the edges Toshiba includes an extremely healthy selection of ports. The left side bears a USB 2.0 port, an exhaust vent (always appreciated on the left so it doesn't melt your mousing hand), a VGA port, an Ethernet jack, an HDMI port, a combination USB 2.0/eSATA port, an ExpressCard/54 slot, and dedicated microphone and headphone jacks. On the opposite side are the slot-loading optical drive, two more USB 2.0 ports, a modem jack, and a power jack next to a Kensington lock. The memory card reader is on the front, next to a—thank the heavens—dedicated physical wireless networking switch. It's a small touch but it's welcome. Honestly, the shame of the machine is the "Fusion Finish" and we're thankful Toshiba is eschewing this on their newer models. There are so many attractive value-adds—the quality speakers, the slot-loading drive, the backlighting in the keyboard, the physical wireless switch—that it's unfortunate the A505D is burdened with all the gloss and a poor keyboard. We don't like glossy laptops much, and the general consensus based on previous reviews appears to agree with our opinion. Keep the layout but change the keys and the coating and we'd be a lot happier with the A505D. Of course, if you happen to like smooth, glossy surfaces the Fusion Finish and our criticisms of it can be tossed out the window. Find one in person at a local store and see what you think.